Sorry if this is a dupe, but after reviewing some 20 or so threads, nothing showed up??? Summit say the outer sleeves on the upper control arms need to be reused. Is that your experience? What's the best method of lubricating the old/new bushings to help with the removal and install? And, what kind of reinforcing is necessary to prevent warping when putting the arms on a press? Also found this pic in another thread and this is what I'm dealing with. BTW, what purpose do the weights serve? With many poly bushings you need to reuse the shell, one way is to torch them out by burning the rubber. I have also had luck just drilling through the rubber so that you can push it out. 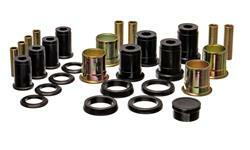 do you have a part number for those bushings? Be aware that with poly bushings in all the control arms their can be some binding because of the different swing lengths. Poly has very little "give" and can also be difficult to install if all the bolt holes are not lined up perfectly. Rubber ones can be a bit more forgiving in both respects. Hi Clyde, thanks for that. One question though, wouldn't the binding be a product of the length of the metal arms and therefore resulting from bad engineering? Of course, if the lengths are off from the factory/engineer, it sure could cause binding. Ok, here's how I was able to get them off, well at least the first two of eight. Mount the arm horizontally in a sturdy vice with the ferrules horizontal. Heat the outside sleeve with a propane torch evenly all the way around. After the rubber has had a chance to start smokeing for about 3-4 minutes and with a long bolt through the ferrule, pull hard by hand. Might help to have some sort of handle on the threads - I was able to pull on just the nut. At first it only moved a little, but a bit more heat did the trick. The rubber doesn't melt, it just releases the bond. Now all I need to do is get the new ones in there - probably some silicone grease and a vice. I cut a piece of two inch angle to place between the control arms when installing the new bushings. This prevents the arm from bending when pressing them out and back in. My original upper and lowers pressed out with no heat. With rubber bushings the binding isn't much of a concern as the rubber just compresses, it's more apparent with poly or solid bushings that don't give like rubber does. The upper arms are very short because there just isn't enough room to make them longer. Yes, something like that will work. I cut a piece of angle the proper length for the front arms as well. Be sure to use the short piece between ears on the lower control arm as well. I simply use a piece of PVC pipe, cut a slot into it so it fits around the bushing and is the same width as the space on the control arm. It's simple and cheap and is strong enough to prevent the channel from collapsing.